Amidst rumours that Mahesh Babu’s Maharshi is yet to complete, the film got completed as planned. Long back itself, it revealed that the Pumpkin breaking ceremony is fixed for April 18th and here comes the clarity about from the superstar itself. 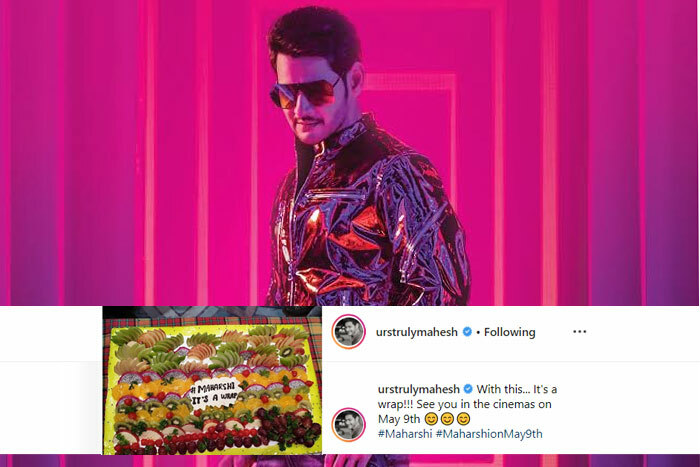 At the closing of the night other day, Mahesh has announced on social media that it is a wrap for Maharshi movie. ‘See you in theatres on May 9th’ he says, sharing the picture of the wrap-party cake. Now that the superstar announced this, it is confirmed that there is no delay in the film’s release. Directed by Vamsi Paidipally, Maharshi features Mahesh in yet another socio-political subject if the songs of the film are anything to go by. Also, the film is said to be dealing with the self discovery angle of a brilliant guy who goes all the way to the USA to become a successful millionaire and then comes back home to find his true happiness.